There are varied types of garden hoses that picking one model among many can be a huge task. However, we are here for you with this Hercules garden hose review. This way you get to see why it is among the celebrated and favored, garden hoses in the current market space. If you are looking for a lightweight, highly portable and durable metal garden hose, then Hercules hose by BulbHead is the best choice for you. This garden hose will not tangle or kink even with constant use. Its design, as well as ease of use, makes it an all-round hose that can be used by children, the elderly and anyone else, even those with arthritis. How Did Hercules Garden Hose Fared in Our Tests? You can yank, pull and even drag this metal power hose and it will still work. This is all due to its durable construction that consists of strong interlocking armor design and metal casing. This construction also allows for easy and versatile watering or cleaning with it. When it comes to using, this garden hose will not give you any issues by constantly coiling and flipping around, with water. This is because it is a one of a kind high-pressure garden hose, which will not kink, leak or tear even as the years pass. Besides, it comes with its own hose reel, which you can use to unroll and coil it during and after use respectively. This feature can save you loads of loading and unloading time as well as storage space. 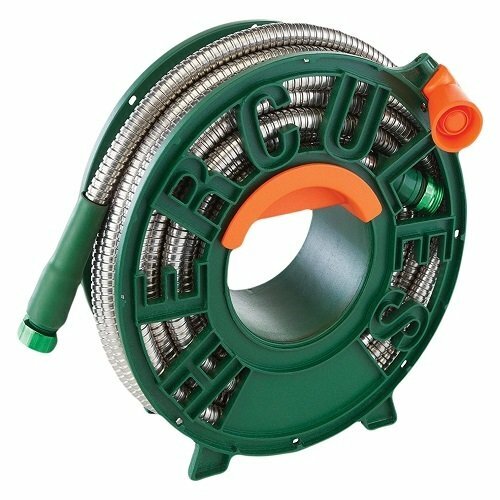 This 100-foot Hercules hose has a virtually indestructible high-flow stream that is great for watering different parts of your property from the garden to the flowerbed. It can also be used to wash or clean cars, pets like dogs as well as cleaning the gutter or sidewalk. Therefore, if you are looking for a power hose, then look no further than this Hercules water hose. Its price is at par with its functions and level of durability, so there are no rip-offs here. What Makes This The Perfect Metal Garden Hose? Here is a detailed look at some of the top features that make this garden hose stand out from the rest of the metal garden hoses. Garden hoses are often at risk of being accidentally run over by a lawnmower or a car, worse it can be spoilt and beaten by the hot flames of the sun, leaving it all split and leaking. Most of these hoses are not tough as they look, they cannot take a hard beating or survive from the harsh elements of the outdoor environment, and that is why you need a Hercules garden hose. Unlike rubber garden hoses, this type of garden hose is highly tough with a harness power of a thousand men. 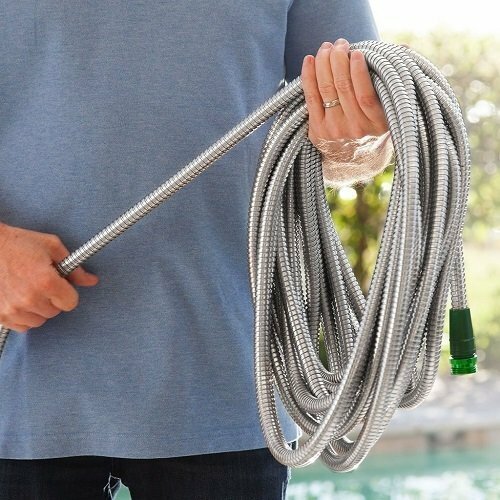 A kink-proof, leak-proof and tear-proof stainless steel garden hose that can last for years, without ever giving you issues. This is as long as you care for it as recommended. Its level of durability is due to its super tough exterior cover that keeps its interior part protected and safe from any kind of damages. Thus, it is designed to survive all manner of accidental run-overs as well as the scorching sun. This Hercules garden hose has an interlocking armor design as well as metal casing on its exterior part. Thus, giving it a high longevity period, compared to its top competitors. This exterior cover is what makes watering easier with time because no matter how long you use, it will always be protected from constant garden mishaps like snagging on the fence, being crushed by car or lawnmower tires as well as the summer heat. You should not assume that since this Hercules water hose is made from metal it is bound to be heavyweight. Most of the modern garden hoses market has shifted to the lightweight nature in a bid to attract different kinds of customers. Nonetheless, this Hercules model is ideally light and highly portable, at only 11.2 pounds. This translates to easy maneuverability as well as ease of use. As you know, dragging a garden hose across plants and yards can be a real workout experience, which can leave you more tired than rejuvenated. Though, expandable garden hoses are the best alternatives in this situation. Besides, it can easily coils after use, for proper storage on its hose reel. Thus, saving you from the agony of winding it, as you know that winding a garden hose is often an athletic challenge that many do not look forward to. Unlike most hoses that tend to leak if, kept in a bad way this Hercules hose cannot leak even a single drop. This is all due to its heavy-duty material construction that protects its interior tube from any leakages as well tearing. As for its kink-free design, this is all attributed to its interlocking design. Therefore, do not expect the hose to fight you when you are using it, be it due to water pressure or anything else. A good hose has quality connections, and this Hercules water hose is not short of the glory. It has great connections that are anti-leak and easily attaches to the faucet. A strong link at the faucet always means that the garden hose will not lose pressure due to any leakage at the water source. Therefore, if you want a top-quality garden hose that is made from stainless steel pick this hose. As you have seen it has unlimited functions and a high longevity rating. So you are bound to get only what you have paid for. 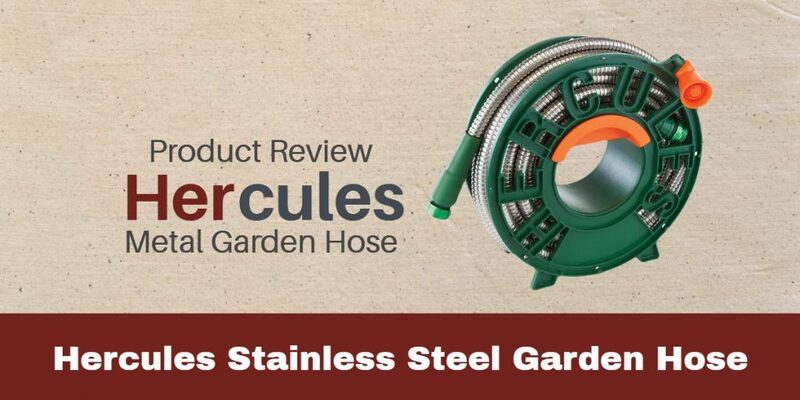 Moreover, this Hercules garden hose review is not a marketing strategy for the garden hose, but rather an informative piece that can help you make a choice among varied types of garden hoses. You can share it with family and friends, it is legit and well worth it, so is the product.